Crafting my library, 10 minutes at a time. "Mom! How many more days until Halloween?" I decided to make them a Halloween one, based on a Christmas advent calendar tutorial I found on Pinterest. I know, so much for that whole "crafting my library" thing. 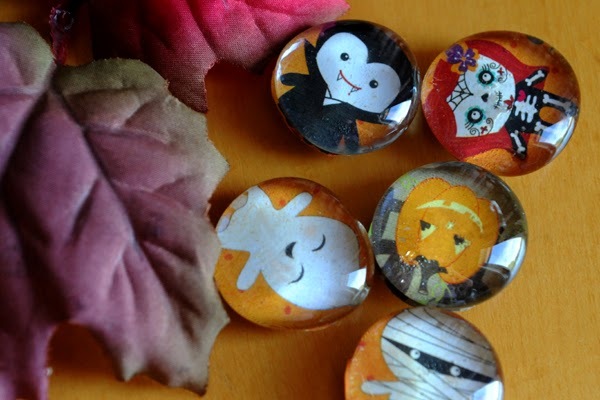 I'm thinking of changing my tagline to "crafting my pins, 10 minutes at a time ..."
What I love most about it is that it uses dollar store supplies. The cookie sheet came from The Dollar Store and so did the flat-backed glass marbles. Then all I had to buy was some Halloween scrapbooking paper and magnets. I already had some Mod Podge. Cut the numbers out of your scrapbook paper and paste each one onto a black square. 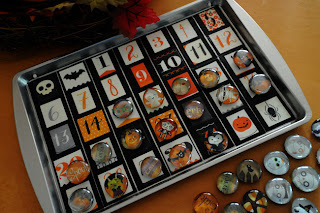 Tack the numbers to the cookie sheet (I used two Halloween designs on either end of the calendar to make the numbers even out). Mod Podge over the whole thing. I used two coats. Meanwhile, cut little Halloween characters/phrases/scenes out of the scrapbook paper. For this part you'd obviously want to choose paper that has pictures on it about the size of the glass marbles. Mod Podge the cutouts to the back of the marbles, then let dry. Glue the magnets to the back of the marbles. I just used Tacky Glue for this. Drill holes at the top of the cookie sheet so you can hang it up. Done! OMG!!! Love it! I'm also going to use our upcoming Close To My Heart Base & Bling Jolly Holiday Style Sheet to make a Christmas one too!!! Thanks for sharing! My goal is to complete one project from each of the quilting/knitting/crafting books in my library, which believe me is no small task. The problem is, I tend to get distracted by other things, like my four children, cooking, my other blog, and Pinterest. Damn you, Pinterest.